Shirley Holden has been a tip worker in the food service industry for more than 20 years. All of her food service jobs — from casual and fine dining to hotels — have had one common theme: instability. “You never know when you show up for work if you are going to make any money,” Holden said, whose hourly rate as a tipped worker is $6.95. The resident of Chicago’s West Pullman neighborhood said even when she had a stable food service job at O’Hare International Airport — which was a 6 ½-hour commute round trip — she wasn’t able to pay her bills, making just $239 a week and paying $28 per week for a bus pass. She makes ends meet with the help of food stamps and Medicaid. Charles Lovett works at a Dollar Tree in Joliet. He says there are times that he does management level work, but still only makes $8.95 per hour. He lives in Section 8 housing with his mother in an effort to make ends meet. “Everyone in the state should be able to be allowed to have a roof over their head, lights and every other utility, groceries and their basic expenses covered,” Lovett said. It is for Holden, Lovett and others in low-wage positions that state Senate Democrats are pushing for a $15 per hour wage minimum in Illinois. Senate Majority Leader Kimberly Lightford (D-Maywood) is carrying the torch for the effort, pushing a minimum wage hike as a priority issue to start the spring legislative session. 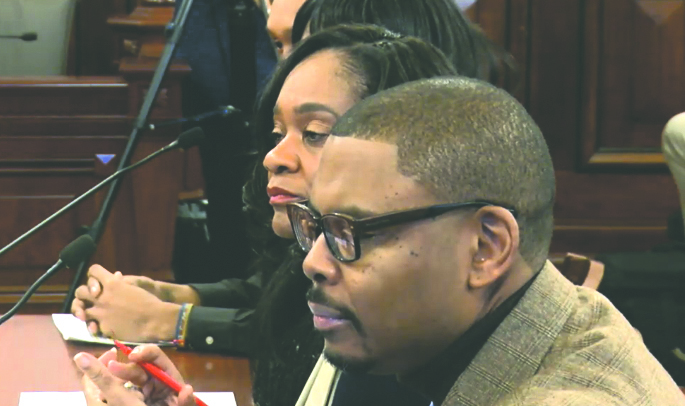 The legislation, Senate Bill 1, is being negotiated with the intended goal of eventually raising the minimum wage in Illinois to $15 per hour. Lightford knows the increase won’t be immediate and that it could take until as long as 2025 for the full increase to be phased in. 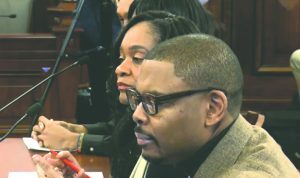 Lightford was part of a state Senate Labor Committee hearing on the minimum wage hike proposal Jan. 30. Panel members discussed the need for raising the minimum wage as well the pay of tip workers, the youth sub-minimum wage and support for small businesses. The last increase in the state’s minimum wage was approved in 2006. That hike was phased in, with the final hike to $8.25 per hour in 2010. Nikki Budzinski, senior adviser to Gov. J.B. Pritzker, said the governor is supportive of increasing the state’s minimum wage to $15 per hour. Greg Kelley, president of SEIU Healthcare, noted that many health care workers are making less than $12 per hour. The Service Employees International Union representative said that the city of Chicago and other states have instituted a minimum wage hike and not seen businesses fleeing. He noted that Chicago currently has a $13-per-hour minimum — en route to $15 per hour — and there has not been a loss of jobs. Holden said tip workers are believed to “have to work” for their tips, encouraging sexual harassment. She said male patrons expect waitresses and other female servers to flirt with them in order to get tips. Unwanted passes from customers is a common occurrence in the food service business, Holden said. “It has nothing to do with providing fast, friendly and professional service,” Holden said of tipping from male customers. She noted that 71 percent of tip workers are women living in poverty. Lightford noted that currently restaurants are only required to pay servers 60 percent of the state’s minimum wage. The other 40 percent, she said, is expected to be made up through tips. Holden said that restaurant employees should be paid at the state’s minimum wage rate, not a lower rate to help restaurants cut corners.